Our range of Clip In Ponytail extensions are made from high quality Japanese Kanekaelon Synthetic fibre. Three of the styles we stock are fully reversible to give you two great looks for the one low price. 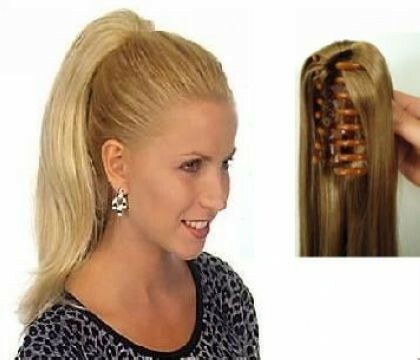 Clip your ponytail extension in one way and have straight sleek hair. Flip it over and clip it in the opposible way up and you now have a longer layered style ponytail. Available in a range of colours. Each Ponytail attaches with either a strong and secure Alligator clip, or a draw string attachment. Simple to put on...tie your hair back into a Ponytail or Bun, then hold open the Alligator clip and clip in on over your own hair. The Alligator clips are very strong and will hold the Ponytail on very tightly.